This week 20 bloggers from THE Book Club on Facebook are posting 20 of their favourite books. Each day I’ll be posting my recommendations here, and on the event page with links to the full review. These are not in order of preference, and have been selected across genres to give a wide range of recommendations. 1. The Martian by Andy Weir – Mark Watney is stuck on Mars with no hope of rescue. He only has enough food to last a month. When he gets over the gravity of the situation (excuse the pun) Mark gets to work planning how to survive long enough to get back in contact with NASA. Mark is a sarcastic and humorous in his communications. His tenacity and resourcefulness is admirable. Despite the technical details it is still a reasonably easy read. By the end of the book I was on the edge of my seat as the tension increased to a dramatic conclusion. Overall an easily accessible and thoroughly gripping sci-fi thriller. 2. Britt-Marie Was Here by Fredrik Backman – Britt Marie knows how she likes things, and they must be done in the right way. Coasters must be used, cutlery must be in order and cleanliness is a high priority. This book shows you who Britt-Marie is, how her past has influenced her as a person, and how she changes after taking a job in a place called Borg. Britt-Marie isn’t someone you love as a character straight away, but gradually as you watch her develop. It is full of humour, but also a touching story exploring the lives of each character in turn. Secrets are revealed and heartbreaking stories develop as the community comes together. Their personalities shine from the page and finishing the book leaves you missing them. 3. Station Eleven by Emily St John Mandel – Station Eleven tells the story of a number of characters from before, during and after an outbreak of the Georgian Flu. Kirsten joins the Travelling Symphony; a group of actors and musicians who travel from town to town performing Shakespeare to whoever is still there to watch. In one town the Travelling Symphony meet a man known only as the Prophet. As his name suggests he is a religious man who claims to know of a bigger plan. You get a very strong sense of who he is without really knowing much about him. I loved the way everything was wrapped up so neatly at the end. All of the relationships between characters become apparent and the various storylines completed themselves nicely without feeling rushed or unexplored. 4. Small Great Things by Jodi Picoult – Jodi Picoult exposes the experiences of black Americans using a story of a white baby boy and a black midwife. The book provides a view of the fight to be treated equally and with respect. The writing is hard hitting with punchy one liners that are really quoteable. The story flows smoothly from the past to the present and back again as each character tells their version of the story. It is easy to race through the chapters with the smooth writing style and a clear distinction between the voices of each character. I could imagine this transferring well to a TV series or film. 5. The Ballroom by Anna Hope – It’s 1911 and Ella, John and Clem are living in Sharston Asylum, hoping to be released one day. Men and women are segregated, with the exception of the weekly dance held in the grand ballroom. Normally they are put to work; women in the laundry, men digging graves and working the land. Charles is the head of music at the asylum. The book alternates between Ella, John and Charles to give a tragic, bleak tale of life in the asylum. I was immediately struck by the helplessness of those staying there. Anna Hope used her own family history as inspiration to explore the boundaries between poverty and madness and the responsibility entrusted to doctors. She shows beauty in the grounds contrasted with the despair in the buildings. There is an underlying current of hope in an unjust world, making it a tragic but heartwarming story. 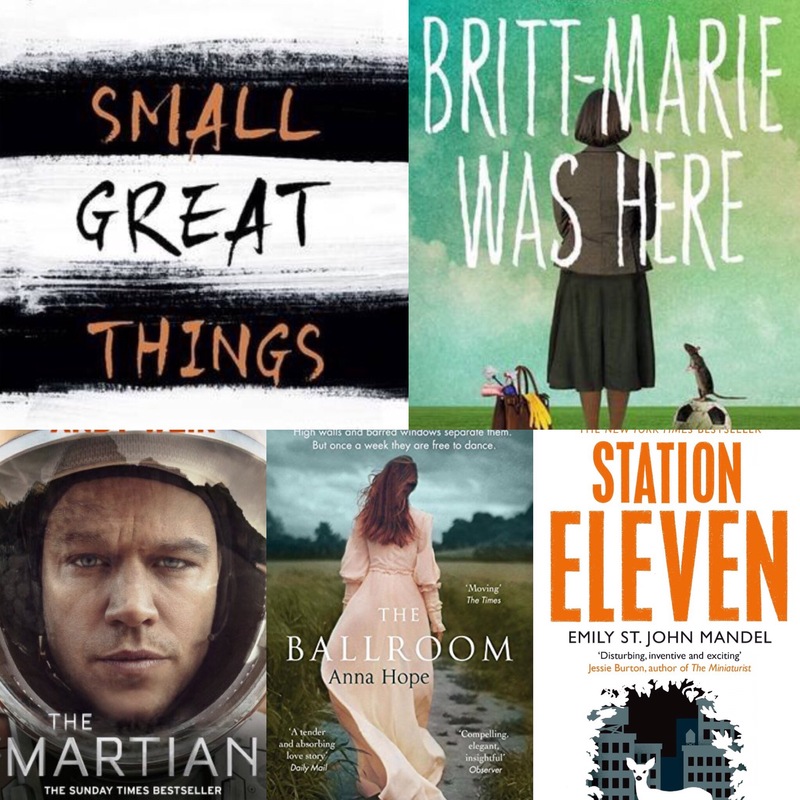 I have to agree with you on The Martian and Station Eleven – both great books in my eyes. I enjoyed Small Great Things but didn’t love it. The others I haven’t read but am interested to try now. One I’m recommending tomorrow might interest you then as it’s quite similar to both of them.